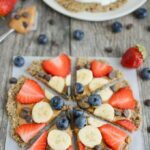 This Fruit Pizza with Oatmeal Flax Crust is packed with fiber and so easy to make. Let everyone top this kid-friendly breakfast or snack recipe with their favorite nut butter, yogurt and fruit! I originally shared this post almost 5 years ago. 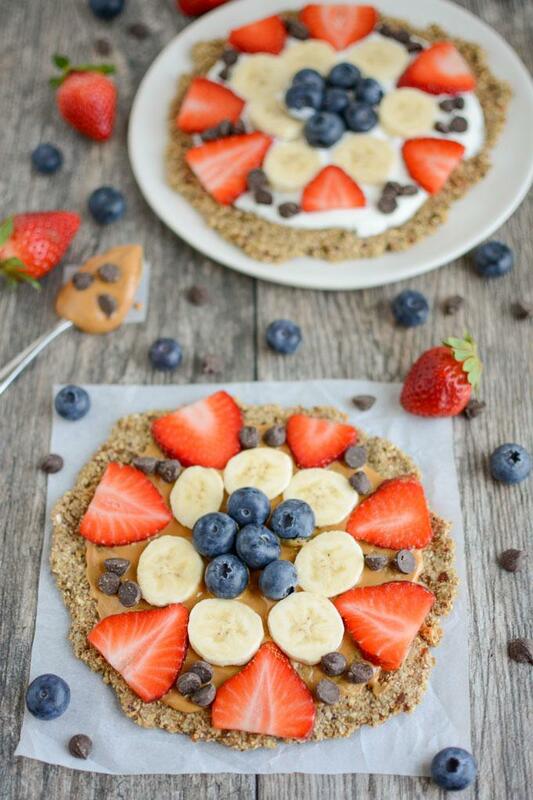 I was on vacation and my friend Lauren, a fellow Columbus RD (we actually did our Dietetic Internship together at Ohio State), took over for the day.. She shared this Fruit Pizza with Oatmeal Flax Crust and this week I decided to give it a little upgrade and reintroduce it to you guys because it’s the perfect, kid-friendly breakfast or snack…especially for summer with all the fresh fruit available! What I love about this recipe is that it’s so easy to customize. I tested Lauren’s original recipe using unsweetened pea milk (instead of vanilla almond milk, adding pumpkin seeds for some extra protein and leaving out the coconut. I found that the crust wasn’t quite sweet enough for my liking. So, I made a few tweaks and Squish loved it! I added a couple of dates for some natural sweetness and added fiber. If you make it with vanilla flavored milk and include the coconut, you could probably leave out the dates, but I like the addition. I also adjusted the recipe to make two personal pizzas at a time. I’ve left the original recipe in the notes section of the recipe if you’d like to see it! 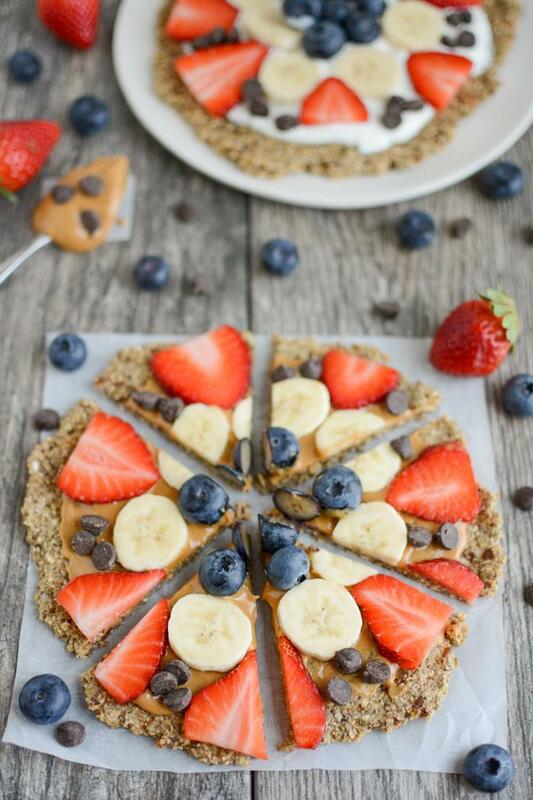 This Fruit Pizza with Oatmeal Flax Crust is packed with fiber and super easy to make. Let everyone top this kid-friendly breakfast or snack creation with their favorite nut butter, yogurt and fruits! Add dates and pumpkin seeds to the food processor and process until chopped. Add oats, flax, cinnamon (and coconut if using) and process until well combined and chopped. Add milk and vanilla and process until a ball starts to form. The dough will be sticky and wet. Scoop out with a spoon, divide in half and use a small piece of parchment paper to press each half of the dough into a circle of your desired thickness. You can also wet your fingers and spread it that way so it doesn’t stick as much. Bake for 8 minutes, then let crust cool for a few minutes. Here’s the original recipe: 1/2 cup rolled oats, 1/2 cup vanilla almond milk, 1 Tbsp shredded coconut, ground flax, 1-2 tsp cinnamon. In the five years since Lauren first shared this recipe, she has started both a blog and her own nutrition business. You can check out her blog and her Instagram for some amazingly delicious plant-based recipes and also check out her website to see what services she offers! Oh wow this looks amazing! So colorful and pretty. I wonder if it would work with chia instead of flax. I’m allergic to the flaxseeds. And yes, Lauren should definitely start a blog! 😛 I’m now about to raid her Instagram page! Pinned! Sounds (and looks) amazing! Followed Lauren on IG too – her foodie pics are gorgeous. Please start a blog asap – I want your recipes, Lauren! I can imagine this on our weekend breakfast menu especially with cashew butter *swoon* ! This looks so freaking good. HEY LAUREN!! Greattttt recipe. Your photos are always fantastic. I need lessons. Do you have a white box or something?? They always look flawless (or maybe it’s because your food is always that good!). Hi Gina!! Thank you SO much! I have a great (white) windowsill in my apartment that provides really good natural light – which gives my pics a little added help! 🙂 Hope all is well with you! That looks amazing! And it sound easy. What a bonus! This is such a fabulous idea!! Think I might have to make it tonight! I’m a huge fan of the fruit pizza!!! This looks absolutely wonderful. I’m thinking today for breakfast…..YES! Wow does that sound good! Thanks for sharing. Ahh this looks like heaven! I absolutely LOVE fruit pizza but not the crust. I love this, and so easy! I love fruit pizza but I’ve never made a healthier version of the original sugar cookie crust with cream cheese frosting…I seriously cannot wait to make this!! Woah! This looks delish! Just pinned it- can’t wait to try it!! I just recently started following your blog and was pumped to see my former college roommate and good friend Lauren featured today! 🙂 She has such great pictures of all her foods, can’t wait until her blog finally starts! That looks delicious! I’m definitely pinning that for later. Wow! It’s beautiful and it sounds delicious. Pinning! This pizza looks delicious! It sounds simple and easy to make. I can’t wait to make this. =) Thanks for sharing. it’s like you know the way to my heart!!! totally pinned to do this later! Beautiful photo & awesome recipe – I have GOT to try this!! This looks incredible! The oatmeal-flax crust sounds like it will have so much more flavor than the cauliflower crust that is my go-to! This looks delicious! How many servings is this recipe intended to make? Does one batch of this recipe = one fruit pizza = a serving for one person? Now that looks AMAZING!!! Even I can make it! 🙂 Easy is good! What an innovative and delicious looking recipe! I love how few ingredients it uses! YES get a blog 🙂 great recipe! This sounds amazing, and the perfect way to mix up breakfast! Hi! I was interested to make this today, but the recipe does not seem to state how much this makes — how many servings is 1 recipe? I suggest this type of info should be included in all recipes you post 🙂 Thanks. I’ve always loved fruit pizzas! So cute, fun and delicious of course!! I made this for a memorial day weekend cookout. Didn’t realize how small it yielded, although tastes super yummy. I blended a banana into peanut butter. Yum! I made this recipe this morning and it was enough for both me and my husband. I didn’t have dates or pepitas so I used a few raisins and a handful of cashews – tasted good but I want to make your exact recipe sometime to compare. [WORDPRESS HASHCASH] The comment’s server IP (174.132.160.34) doesn’t match the comment’s URL host IP (174.132.160.61) and so is spam. [WORDPRESS HASHCASH] The comment’s server IP (173.201.196.146) doesn’t match the comment’s URL host IP (173.201.209.128) and so is spam. [WORDPRESS HASHCASH] The comment’s server IP (76.74.254.36) doesn’t match the comment’s URL host IP (66.155.11.238) and so is spam. [WORDPRESS HASHCASH] The comment’s server IP (209.217.235.130) doesn’t match the comment’s URL host IP (209.217.235.135) and so is spam.